One of the most important goals after injury is return to work or school. There are some studies available that look at return to work/school status as a function of injury severity, demographic and insurance status. However, long-term studies are rare. 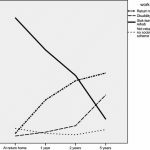 A Norwegian group followed a small population of injured patients very closely for five years, looking at the actual trajectory of return. They also tried to determine the specific factors that predicted return to work. The initial group numbered 101 people, but slowly decreased to 75 due to dropouts, nonresponders, and one patient who retired while receiving disability benefits. The average age was 39 and ISS was 29. About 60% had a lower level of education and blue collar jobs. There were 28 patients with severe head injury, 12 with moderate head injury, 18 spinal cord injuries and 3 amputees among the group. At the end of 5 years, only 49% had returned to work (see chart). 23% were on full disability and 9% on partial disability. Of greatest interest, there was only a small increase in return to work after 2 years. The best predictors of return to work were higher education level, good physical health and function (no surprise), and type of coping strategy. Time spent in rehab was also a factor. Bottom line: Rehab that aims toward return to work is a major factor in getting better after major injury. However, an additional focus on coping and other psychological factors is important. Most people who will be capable of returning to work or school will do so by the two year mark. Reference: Returning to work after severe multiple injuries: multidimensional functioning and the trajectory from injury to work at 5 years. J Trauma 71(2):425-434, 2011.